Pretty in shades of pink by KATHY CHE. sheer top with ruffle accent. 17" shoulder seam to seam. 3/4 sleeve with vent. 23" underarm seam to seam. 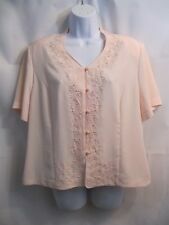 Cute Kathy Che Stretch Blouse Size Medium with Darling Accents. Pin-pleated bodice and accent at waist compliments contours. Abalone shell buttons complete the unique tailored but whimsical look. Condition is Pre-owned. Shipped with USPS First Class Package. Kathy Che Pink Blouse. Silver Buttons On Sleeves & Button Up. Sleeve Length 18". Length 25". Top of shoulder to hem: 23 1/2". Shoulder pads. Button-up Shirt. Material Polyester. Type Button-up Shirt. Discover daily new arrivals in all seasons, sizes and styles that you can't find anywhere else. Color Green. Color Grey. Button-up Shirt. Material Polyester. Type Button-up Shirt. Discover daily new arrivals in all seasons, sizes and styles that you can't find anywhere else. Button-up Shirt. Type Button-up Shirt. Discover daily new arrivals in all seasons, sizes and styles that you can't find anywhere else. Bust darts.Arm pit to arm pit: 27 1/2". See photo for details. Top of shoulder to hem: 29". Color Turquoise. Discover daily new arrivals in all seasons, sizes and styles that you can't find anywhere else. Button-up Shirt. Type Button-up Shirt. Material Polyester. (Note that colors may vary slightly due to differences in computer screen technology and/or settings. I will NOT be offended and can ONLY say yes or no :). Ladies long sleeve button down animal print top. One front pocket. There are shoulder pads but these can be taken out if not wanted. 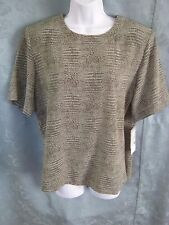 Ladies XL Color Block Blouse • Short Sleeve Shirt • Colorful & Elegant • Nice! Ladies XL Color Block Blouse. • Pullover Blouse. • Colorful & Elegant. • Short Sleeve Shirt. • 2 Buttons at back of neck. 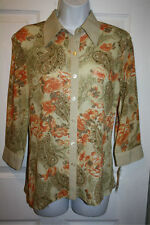 Excellent condition Kathy Che Blouse size 14 46" bust 25" total length 24" sleeve, which adjust to 3/4 sleeve. Clearing out closets and storage containers. This is a pullover style dress blouse. On the back there is a two button loop closure. There are side slits on the straight hemline. There are no bust darts or seams of any kind, so it will drape nicely. Material Polyester,Spandex. Type Shirt. Discover daily new arrivals in all seasons, sizes and styles that you can't find anywhere else. Item Details. Kathy Che green button fron blouse. Pre owned excellent condition. 3/4 sleeves. 84% poly/ 16% spandex. Button front, padded shoulders, pointed collar, long sleeve, single button cuff. Sleeve Style: Long Sleeve. Length: 28″ (top of shoulder to bottom hem). Sleeve: 18″ (underarm to sleeve end). Material : 100% Polyester. Color Multi Colored. Button-up Shirt. Material Polyester. Type Button-up Shirt. Discover daily new arrivals in all seasons, sizes and styles that you can't find anywhere else. Material Polyester,Spandex. Discover daily new arrivals in all seasons, sizes and styles that you can't find anywhere else. Button-up Shirt. Type Button-up Shirt. Color Black. In great condition. No flaws. 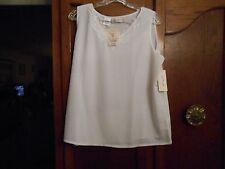 Size 14-16W Underarm to underarm 22.5” Back collar to hem 25” Thank you for looking! Please check out the other items in our store. Combined shipping is available at checkout for non auction items. Type Blouse. Material Polyester. Discover daily new arrivals in all seasons, sizes and styles that you can't find anywhere else. Item Details. Made in Mongolina, armpit to armpit is 24" and length is 26-28" shorter on sides longer in front and back. Button down blouse, 1 pocket in front, long cuff sleeves with buttons. Kathy CHE Pretty Red Blouse faux front pockets with Mother of Pearl accented Buttons. This pretty red blouse is a great addition to any ladies wardrobe. Dress it up or dress it down. Very nice blouse. Type Blouse. Material Polyester. Discover daily new arrivals in all seasons, sizes and styles that you can't find anywhere else. Color Green. Item Details. Color Maroon. Button-up Shirt. Material Polyester. Type Button-up Shirt. Discover daily new arrivals in all seasons, sizes and styles that you can't find anywhere else. Type Blouse. Discover daily new arrivals in all seasons, sizes and styles that you can't find anywhere else. Color Brown. Item Details. 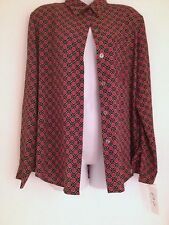 Kathy Che Top Women’s Size 18/20W Red 3/4 Sleeves Top Shirt. A74. Condition is Pre-owned. Shipped with USPS First Class Package. Measurements Shoulders: 18.5” Bust:46” Sleeves L:18” Cuffs:6” Length:29.5” Materials 94% polyester, 6% spandex Thank you for looking please feel free to visit my store desisa0, new listing every week. Thank you! Arm pit to arm pit: 21". Shoulder to shoulder: 16". Shoulder seam to bottom hem: 26". Button-up Shirt. Material Polyester. Type Button-up Shirt. Discover daily new arrivals in all seasons, sizes and styles that you can't find anywhere else. Color Gold,Gold. Discover daily new arrivals in all seasons, sizes and styles that you can't find anywhere else. Button-up Shirt. Type Button-up Shirt. Material Polyester. All details of the product have been included. Material Polyester,Spandex. Button-up Shirt. Type Button-up Shirt. Discover daily new arrivals in all seasons, sizes and styles that you can't find anywhere else. Button-up Shirt. Material Polyester. Type Button-up Shirt. Discover daily new arrivals in all seasons, sizes and styles that you can't find anywhere else. Color Brown. Type Blouse. Discover daily new arrivals in all seasons, sizes and styles that you can't find anywhere else. Material Polyester. Color Beige. Item Details. Material Polyester,Spandex. Button-up Shirt. Type Button-up Shirt. Color Pink. Discover daily new arrivals in all seasons, sizes and styles that you can't find anywhere else. Excellent Condition. Pretty Colors. Size XL(16). FABRIC CONTENT: 100% Polyester . I use Downy Unstoppables Laundry Additive. Type Shirt. Material Polyester. Discover daily new arrivals in all seasons, sizes and styles that you can't find anywhere else. Color Brown. Item Details. Straight Down the Front Center: 18". Across Chest Under Arms: 20". Kathy Che size 14 orange sleeveless top. The top is a lightweight polyester with no darts, no pleats. There are 3" slits at the side seams.